Home › Knowledge Hub › Thought pieces › Is it time to #ReclaimSocial for good? Social media has become too negative with trolls, fake news and angry messages taking over our feeds – and I’m not just talking about Brexit! But why does it have to be this way? Surely not everything is all doom and gloom. Take for example the past 18 months, in this time We’ve seen campaigns such as #MeToo, #GivingTuesday and #YouMadeItHappen filling us with optimism about how social media can be used for social good – to highlight injustices, to raise millions for charities around the world and to share positive stories about our impact and why we exist. Indeed it was the desire to try and showcase how social media can have the capacity to be used for social good that spurred the team I am a part of at Lightful to launch #ReclaimSocial last year. A hashtag designed to counteract negativity on social media by giving organisations a platform to remind people of all the good in the world. We wanted to focus on the positive use of social media to counteract the negativity that kept filling our feeds. Hundreds of charities, social enterprises and individuals joined us on the day to spread their own positive messages using #ReclaimSocial. From inspiring campaigns to people who had been fed up with the negative side of social media, the results were very encouraging. We reached more than 10 million people, we trended on Twitter and we even saw #ReclaimSocial tweets featured across six outdoor billboards in London! We had extremely positive feedback about the campaign, not only on the day itself, but in the continued use by charities of the hashtag #ReclaimSocial throughout the year which made it a real movement for change. In November, charities and not for profits banded together to supported #YouMadeItHappen, which was all about thanking donors, volunteers and fundraisers and showing the impact that their support makes possible. Now we want to build on that momentum to remind people of the difference we make and to celebrate the wonderful people who support us with #ReclaimSocial. 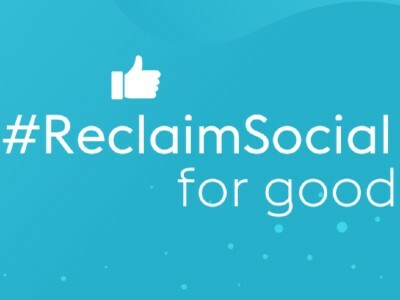 This year, CharityComms, Institute of Fundraising, ACEVO, NCVO and many others are joining us on February 6 to share their own positive stories of how we can all #ReclaimSocial for good, and we’re hoping you will too. We want to share as many positive messages as possible to remind everyone that not everything is bad. After all wouldn’t it be nice to be more positive on social media by focusing on the stories that matter? We all have a story to share and we know that our sector is full of amazing people and causes that do inspiring things every single day so why not celebrate them? The goal is to get as many individuals and charities as possible to spread positive news to shine a glimpse of hope and inspiration in our news feeds. It’s a fantastic opportunity for the sector to show all the amazing work that happens every day and to be at the forefront of positive and inspiring messages. Join in on 6 February using #ReclaimSocial and become a part of a growing movement of positivity on Twitter and other social networks!